We’d love your help. Let us know what’s wrong with this preview of Evanthia's Gift by Effie Kammenou. This Greek American family saga follows a multigenerational story of love, loyalty, and culture. An emotional novel about family bonds and the difficult pull between home and heritage. In the year 1956, Anastacia Fotopoulos finds herself pregnant and betrayed, fleeing from a bad marriage. With the love and support of her dear friends Stavros and Soula Papadakis, Ana is abl This Greek American family saga follows a multigenerational story of love, loyalty, and culture. An emotional novel about family bonds and the difficult pull between home and heritage. In the year 1956, Anastacia Fotopoulos finds herself pregnant and betrayed, fleeing from a bad marriage. With the love and support of her dear friends Stavros and Soula Papadakis, Ana is able to face the challenges of single motherhood. Left with emotional wounds, she resists her growing affection for Alexandros Giannakos, an old acquaintance. But his persistence and unconditional love for Ana and her child is eventually rewarded and his love is returned. In a misguided, but well-intentioned effort to protect the ones they love, both Ana and Alex keep secrets - ones that could threaten the delicate balance of their family. who have shared a special connection since childhood, become lovers. Sophia is shattered when Dean rebels against the pressure his father places on him to uphold his Greek heritage and hides his feelings for her. When he pulls away from his family, culture and ultimately his love for her, Sophia is left with no choice but to find a life different from the one she’d hoped for. To ask other readers questions about Evanthia's Gift, please sign up. "This book is dedicated to my mother. I miss you and think of you each and every day. It was with your whispers in my ear that this story was written. You were, and still remain the thread that holds our family together." This dedication is so beautiful, I couldn’t not share it. Evanthia’s Gift is a generational love story that connects two couples, two countries, and two generations. Part of the book is set in war-time Greece, and it shares with us a great cultural heritage that I could predict a "This book is dedicated to my mother. I miss you and think of you each and every day. It was with your whispers in my ear that this story was written. You were, and still remain the thread that holds our family together." Evanthia’s Gift is a generational love story that connects two couples, two countries, and two generations. Part of the book is set in war-time Greece, and it shares with us a great cultural heritage that I could predict appearing in a Greek family saga, but still was overwhelmed by its beauty and detail. Learning about the Greek culture was one of the parts that I immensely enjoyed, especially, because it was absolutely new to me. The other part of the story was set in New York, my favorite city that I love so much from books and movies. It was nice to read about it once again through a new author’s perspective, and this second setting added a certain flair to the historical aspect of the book. I can’t say I know a lot about the 50’s aside from music, but the way the author described it, the picture was clear as day in my head. This book would make for a great romantic movie about love, family, friendship, and the adventure that is life. One thing that was a great surprise to me was the number of plot twists. For some reason, I hadn’t expected it from a travel romance book. But it turned out to be a real page turner, and I could never predict what would happen next. A roller-coaster of emotions, this book is for romance readers who believe that even the most tangled story can have a happy ending; it’s for fans of women’s fiction and multigenerational stories, tied neatly together. This is such a beautifully written story that begins in 1956 with Anastacia Fotopoulos fleeing her home and husband after he has betrayed her in the most unforgivable way possible. Her husband is unaware that she is having his baby, something that she will keep from him as she finds it impossible to forgive him. The story follows Anastacia and her daughter through their lives, loves and two continents. It is a time when old traditions collide with the modern world and rebellious teenagers. I love This is such a beautifully written story that begins in 1956 with Anastacia Fotopoulos fleeing her home and husband after he has betrayed her in the most unforgivable way possible. Her husband is unaware that she is having his baby, something that she will keep from him as she finds it impossible to forgive him. The story follows Anastacia and her daughter through their lives, loves and two continents. It is a time when old traditions collide with the modern world and rebellious teenagers. I loved learning about Greek traditions and cultures and was absolutely delighted with the delicious recipes that were shared in the story. I shall try out some of these myself in the future. There were strong bonds between families that I loved as they were always there for each other in good and bad times but some of the traditions were hard for the second generation in the story to follow, especially in the USA. This became a costly rebellious action for one young man in terms of losing who he loved for the sake of making a point. I really did cringe at his actions. It really was a matter of cutting his nose off to spite his face. I really could not believe what he sacrificed and my heart sank. There is such a lot of love in this book, not just between couples but between families too. Times when a mother holds back waiting for her child to come to her to be comforted because she knows her child is hurting but also a child thinking she is protecting her mother by keeping things from her. So many times I recognised my own feelings in them. Heart ache and love. Just such a lovely book of life. Evanthia’s Gift is a one-of-a-kind story. It all starts with Anastacia Fotopoulos, in 1956, when her world turns upside down. Deceived and heartbroken, Anastacia faces indescribable challenges such as single motherhood. After finally finding herself and healed from the past, Anastacia lets herself be happy. The drama progresses on with Anastacia’s daughter, Sophia, where she is left with no choice but to be strong for herself and her family. I have to say that the title of this book is so allurin Evanthia’s Gift is a one-of-a-kind story. It all starts with Anastacia Fotopoulos, in 1956, when her world turns upside down. Deceived and heartbroken, Anastacia faces indescribable challenges such as single motherhood. After finally finding herself and healed from the past, Anastacia lets herself be happy. The drama progresses on with Anastacia’s daughter, Sophia, where she is left with no choice but to be strong for herself and her family. I have to say that the title of this book is so alluring that I wanted to know the meaning behind it. After a long time analyzing the title, I came to a conclusion that Alexandros was Evanthia’s gift to Anastacia and her family. It makes sense since Alexandros helped Anastacia in so many ways and was the person that Anastacia desperately needed in her life. After the sad marriage she had, it was extremely hard for her to trust and love somebody new. It was a very difficult task for Anastacia to stay at peace and happy with herself. Alexandros changed her life for the better. Alexandros had a horrible past, but he didn’t grow up as a bitter, hateful man but as a hard-working and smart man who had values. I might be wrong, but I think Alexandros really was Evanthia’s gift to everyone that Alexandros made contact with. The main reason I enjoyed reading Evanthia’s Gift is because of the Greek culture and history. I loved knowing about places in Greece, Greek words, and Greek Orthodox Christianity. At first, the Greek customs and beliefs were very foreign to me, but after a few hundred pages, Greece felt like home to me. Every time a chapter ended, the following pages were Greek food recipes which I absolutely adored since all the food she stated sounded so good. It also made the story more real since every time a character cooked something Greek, Kammenou would write the recipe so the readers could also try it and get a taste of Greece. This book had a beautiful aura. The only downside was that the author barely mentioned what specific greek words meant. Every time the author wrote something in greek, I had to use context clues to determine the meaning of those words. Overall, I loved how Kammenou made Greece so familiar, memorable, and real to someone that’s only seen Greece in pictures. I could touch the white walls and smell the salt water from the crystal blue beaches that Anastacia constantly talked about. I've come to realize that family sagas are one of the most interesting types of books that I read this year. There is, of course, my favorite: A Tree Grows in Brooklyn by Betty Smith; too there was Pachinko by Min Jin Lee. As the year draws to a close, I was able to read/listen to Evanthia's Gift, a story of Greek immigrants and their family as they move back and forth between Greece and America and, finally, raise their children as Greek-Americans in a time when identity is something hard to pinpoint, particularly one that has dual countries contributing to who they are. The book opens with betrayal, but even in that Anastacia, the first main character, finds some hope: her daughter, Sophia. As the story progresses there is still much doubt and pain. Anastacia struggles with what to tell Sophia about her father and, with her friends old and new, the lingering effects of World War II in their homeland, Greece. The movement from her earliest feelings of betrayal to the slow effort of healing, delayed as it was by self-doubt and trouble from the past, was a tender experience for Anastacia and her readers. There were moments of beauty, such as when she is walking through her hometown and by the sea during her later honeymoon. There were almost moments of personal pain, such as recovering from a late-term miscarriage and hysterectomy. Anastacia was a strong character, even at rock bottom moments, and her and Alex were a wonderful couple to read about. There were reminiscences throughout that were painful and saddening. Anastacia remembering rationing and the black market. Alex recalling trying to find a beloved merchant and searching the place he knew him most likely to be: boarding a train, guarded by Nazis. Not to compare the heartache to these previous examples, but even the love of the young, the desperation in the relationship between Sophia and Dean, was hard to bear because of their young age, the intensity of such feelings, and the knowledge that there is heartbreak in their past and probably their future as well. I wasn't a fan when the story turned from Anastacia and Alex and their generation to that of their children because it felt like two separate stories that were only loosely connected. Sophia was a bit difficult to like half of the time because of her infatuation with Dean. Her determination was almost admirable in that she knew what she wanted and held on to that, but I think it hurt her in some ways because she was pinning so much hope and almost her entire future on this one guy when she was still so young. There's an entire future ahead of her, but from the age of twelve onward she's sure that she would go through anything, wait forever even, if only Dean could be hers. Anastacia and Alex's relationship was much more emotionally rich than that of Sophia and Dean. When things go wrong between them, primarily Dean's fault through some lies with Sophia, much weight is loaded upon her. Her melancholy is exaggerated, too intense, and yet Dean puts the burden on her, refusing to accept responsibility for his part. A textbook teen romance, something of Lifetime movies, once Sophia and Dean started dating, their relationship and the dissolution of it, was a serious downswing in readability. Sophia states at one point that she has grown as a dancer and as a person; while I might accept her dancing ability, her growth as a person is debatable because of her pining for Dean, her insistence that he will be the only man for her ever, despite their separation and the pain he's put her through by keeping their relationship a secret. Dean continued to be a disgusting character that I disliked more and more as time went on. His possessiveness of Sophia, even years later, was creepy as hell, especially since he kept insisting he'd evolved and moved on with a woman named Elizabeth. Sophia wasn't much better, frustrating as she was clinging to Dean, to the past, almost as much as he was. The callbacks to Romeo & Juliet were cringe worthy in their accuracy. The way the secondary female characters Irini (Anastacia's sister) and Elizabeth (Dean's wife) were treated as "developed" characters was disgusting. They were set up as shrewish if only to bolster the primary ladies in their generation. Loading them down in favor of other women felt extreme and a bit hostile. While Elizabeth admittedly had some traits, some snobbishness, that made her unlikable, I think I understood some of her aversion to Dean's family. Considering how they treated her, his parents because she wasn't Greek and his sister because she wasn't Sophia, I don't blame her for sticking to the people she knew and was comfortable with. The second generation in this family saga was full of people that couldn't figure out their own minds and kept making bad decisions regarding personal relationships. The silent treatment doesn't work and as much as the reader is meant to like Sophia, I kept rolling my eyes at her childish behavior. From seventeen to the end of the book, she in particular felt immature; at 41, her voice, her presence in the book, doesn't feel like she's grown from where she started. Emily Lawrence was a very good narrator. The quality of her voice made the epic story a pleasant experience and that's essential, particularly when the book was so long. Her accent for the first generation of the story was, as far as I could tell, accurate and it set them apart from their children, who know Greek but have grown up primarily in the United States and thus have more exposure to American sounding voices. The beginning of this book was far superior to the later two-thirds and while I disliked Sophia, Dean, and others of that time period, Anastacia and Alex's story is worth the read. The interludes of Greek recipes and of excerpts from poems and philosophy texts, while not always making sense in context, were a nice way to break up the monotony of the drier moments. I would not count this among my favorite family sagas, but I think it might reach others that enjoy lighter novel atmospheres, wanting to branch out. Evanthia’s Gift was a beautifully written two generation Greek-American love story, once I started reading it, I hated to put it down. The book starts out with Ana & Alex’s love story, what a wonderful love that was, Alex had loved Ana from the first time he met her in college but never let his feelings known and lost his opportunity when she married another. They meet few years later through a mutual friend and this time he never let the opportunity get away this time. You could just feel h Evanthia’s Gift was a beautifully written two generation Greek-American love story, once I started reading it, I hated to put it down. The book starts out with Ana & Alex’s love story, what a wonderful love that was, Alex had loved Ana from the first time he met her in college but never let his feelings known and lost his opportunity when she married another. They meet few years later through a mutual friend and this time he never let the opportunity get away this time. You could just feel how much Alex loved & cherished Ana & her daughter Sophia, who he adopted, he would not stop until Ana trusted & loved him. I could just feel the pain the couple went through early in their marriage, it almost destroyed them but as a couple they love was more powerful than it was before the tragedy. I loved Alex & Ana’s story but to me the best was yet to come with Sophia & Dean’s story. Sophia & Dean’s love story there was so many ups & downs, when you finally thought yes a big NO came. Dean had always thought of Sophia as another sister along with his own sister. They were always together, with their parents being best friends, more like family, living next door to each other, family functions & Sophia as far as she could remember Dean was always her “Dino” & she always loved him, until one kiss that changed it all. There was so many times I wanted to go through the book & wring Dean’s neck, shake him until he finally realized what was right in front of him. But eventually, many years later, he did it for me finally opened his eyes and realized what truly mattered in life. This book took me on an emotional roller coaster, I was laughing, yelling at the characters, and find myself crying. I also loved learning so much Greek history, I myself never knew their was Greek Jews, and the struggles that Greeks had to through to keep their beliefs. If you are looking for a beautiful love story that will take you away on a emotional rollercoaster, that expands over 50 years, I recommend you grab a copy of Evanthia’s Gift today! Effie Kammenou has earned a new fan in this reader, & I can not wait to get my hand’s on the next book in the The Gift Saga! I received a copy from the author for my honest review. A mesmerizing romance over two generations. In the first part of the story, we follow the beginning of Anastacia and Alex romance as they try to overcome their past to be in relationship and work it out together. Single motherhood, destroyed and got her heart broken by her first mariage, Ana will not allow herself to trust any man. Alex will have to teach her to love herself again and trust him. They will discover that each of them has their own dark past. The second part of the book, takes on t A mesmerizing romance over two generations. In the first part of the story, we follow the beginning of Anastacia and Alex romance as they try to overcome their past to be in relationship and work it out together. Single motherhood, destroyed and got her heart broken by her first mariage, Ana will not allow herself to trust any man. Alex will have to teach her to love herself again and trust him. They will discover that each of them has their own dark past. The second part of the book, takes on their daughter Sophia, who will develop a childhood love with Dean , who happens to be the son of Anastacia's best friend : Soula .We also get to see the dynamic in a Greek family, what are their values and religions. What is interesting in this novel is the fact that we get to see how the children will have their own struggles as culture and family traditions will come to try and separate them. The two parts were greatly integrated and we see the struggles each couple from different generation have to face. In the end, everything will make sense and we see all the connections from the past to the future. It was quite a fun and emotional ride reading this book! A lovely romance story that stays with to make you happy. Heartache as well, that needs to be solved. A not to be missed book by anyone. I just finished this book last night. It was a win from Goodreads and I am glad I won it. This was one of the best books I have ever read, it was a long book but I never lost interest. The love that Ana and Alex had for each other set such a good example for Sophia and Dino even though they lost each other, in the end they refound their love. I didn't like the way Irini showed up at the funeral it just sort of put a damper on the ending for me. I hope Effie offers book two on Goodreads and if no I just finished this book last night. It was a win from Goodreads and I am glad I won it. This was one of the best books I have ever read, it was a long book but I never lost interest. The love that Ana and Alex had for each other set such a good example for Sophia and Dino even though they lost each other, in the end they refound their love. I didn't like the way Irini showed up at the funeral it just sort of put a damper on the ending for me. I hope Effie offers book two on Goodreads and if not I will surly look for the release date. I love books, I enjoy reading them and listening to audiobooks, sometimes separately, sometimes together. I did both with this book and it blew me away, the story and narration is beyond exceptional. It should be called Effie Kammenou’s gift because that is what it is. You can feel the love she put into this story flowing off the pages. It is well written and well told. The character development is beyond amazing. This multigenerational story begins with Anastasia in NYC it follows her throughout her life and meet her family and friends along the way. Actually you more than meet them you get to know them. I loved the bonds and friendship she shared with Soula and Stravos and how supportive they were from the start, also loved how protective her Uncle was too. I adored Alex, he was so loving and understanding. I was happy for Ana and Alex. The 2nd part of the book brings you to Sophia’s story, it includes all the people in her life, some you were introduced in the 1st part, others are the new people she meets in her life. You learn more of Dino & Demi, Soula and Stravos’ son and daughters and Sophie’s best friends and side kicks growing up. You are given views into their angsty teenage years and as they mature to adults, the paths they chose in life and lessons they learn. It is amazing how Effie Kammenou manages to bring the reader and/or listener into her story, places you right along side the characters, allowing you feel what they feel. I cried when they cried, felt their emotions and yes, I even got mad at some of their actions, mainly Dean’s and then Sophie’s. I can say so much more about this book, it is an original, heartfelt story, an exceptional one from start to end and I highly recommend it. I am looking forward to reading & listening to more of Effie Kammenou’s work. Thank you so much for this great & enjoyable story and for the for the great recipes too! Anastacia Fotopoulos has moved to the USA after the horrors of the second world war in order to educate herself and so take a step closer to fulfilling her dreams. She hadn’t anticipated falling in love and marrying the first handsome man to come her way, nor less to then be cruelly betrayed by those closest to her. It is 1956 and she finds herself alone, pregnant and ashamed to return home to Greece. She is fortunate in the support of her wonderful friends Stavros and Soula, also first generation Greek immigrants, and her Uncle who gives her employment to keep a roof over her and her new baby daughter’s heads. The last thing that she expects is to attract the attentions of another young Greek man from her student days, and when her friends try to match make her with Alex she is determined to resist. She will never put her future in the hands of a man again. Ana has no idea that Alexandros Giannakos has loved her since he first knew her, and he wins her over with his perseverance and love for both her and daughter Sophia. Their friends have had two children, Dean and Demi, and life for the close Greek American families is good. But secrets have been kept, with the best of intentions by all involved, and these will affect life in the future. The storyline skips forward to the teenage years of the children, and whilst the girls are closer than sisters, a deeper relationship develops between Dean and Sophia. Their Greek heritage remains extremely important to the families, particularly the older generation, and teen Dean cannot bear to have his life mapped out by his parents – he wants to be an American boy who goes to college and finds his own way in the world. As a result, he refuses to acknowledge his feelings openly for Sophia and as he pulls away from the family traditions, Sophia too has her young heart broken. Life continues for the families. Dean marries a college girl and goes to work for his father in law, Demi marries her secret childhood sweetheart and Sophia throws herself into her career as a dancer. Along the way family secrets emerge that threaten to splinter relationships, and the rock the families to the core. If you enjoy family dramas that span generations, without sugar coating life, then you will love this novel. The historical element of life in war torn Greece was fascinating, as was the story that was so common to many immigrant New York families be they Greek, Italian, Irish….the author is herself a second generation Greek American, and she appears to have exactly the right understanding between the need for embracing their heritage and culture for the older family members, to the desire to be American youngsters and growing up in America for the youngsters. The friction was palpable in the writing. The characters all grow and develop throughout the course of the novel as life throws both expected and unexpected joys and sorrows at them. Ana remains at the core of the story, and I love the way in which both she and Soula are presented as the strong women keeping the wheels of their family life oiled and turning. The secret to this is food! I recognised in this book one of my own close friends, who moved to London from Athens in the 1980s, and is the most amazing homemaker and cook. My kids love to go to her house and she feeds us all in a very similar way to Ana and Soula in the story. The descriptions of the food are enough to make the reader’s mouth water, but then the author will offer up a wonderful gem every few chapters with a complete Greek recipe. Imagine my delight when I also found that the author has a recipe website! I am so excited to try cooking some of these mouth-watering delicacies! Evanthia’s Gift is a love story that covers generations, continents, different loves lost and found – but it is so much more than a love story, it is a story of human life and emotions over a fifty-year period. I wanted to shout at the characters when the miscommunication caused problems and altered the course of lives and changed choices made. I cheered when decisions ended well, and I shouted and cried at the bad decisions and the sorrows that life dishes up. This book depicts real life – not everything can be planned, not everything is sugar coated and joy is tempered with sadness. If you haven’t guessed I loved this book and am really looking forward to the next one in the series….and yes, you will find out who Evanthia is and just what her gift is. Complete with recipies for famous well-loved special Greek dishes. It is said, "be true to yourself." I found this story to be a delightfully charming real Greek story, spanning four generations, as written by Effie Kammenou. I am not Greek but went to school with a Greek girl who shared something of her culture with us. At reunions we revel in her gastronomic creations. I adore Greek dishes like buttery feather-light biscuits, bulging with almonds and rolled in icing sugar, although I would be the size of a house if I indulged in honey, nuts and cinnamon infused phyllo pastry more often. I drool at spinach and feta cheese dishes and would happily eat a huge one single-handedly. I copied a recipe or two to try later. However it was the Greek tragic emotions, raging passions, and vibrant colourful love of life which is portrayed so clearly in this story which appealled so strongly to me. What a stunning read! This author was indeed true to herself, honouring her Greek / American culture equally. Alex had a love that was so deep and affected so many around them. Sophia, Ana's daughter, and Dean's love story started when they were teenagers but didn't come together again until years later. The author keeps the reader engaged with the rich development of the characters and plot. 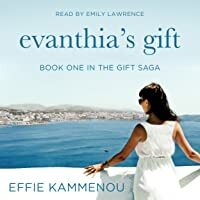 I have just finished listening to Evanthia’s Gift by Effie Kammenou, and I’m sad... sad that I came to the end of the first book in the series. I’m just grateful that the next book is available! This is a beautiful story that spans over 50 years and multiple generations. I loved getting to know the characters and following their lives. I really feel like I know these characters and I truly care about them, having experienced their joys and sorrows, through the good times and the bad. Emily Lawren I have just finished listening to Evanthia’s Gift by Effie Kammenou, and I’m sad... sad that I came to the end of the first book in the series. I’m just grateful that the next book is available! Emily Lawrence delivered a stellar performance. She handled all the different characters wonderfully, with the wide range of emotions and the accents. The book truly came to life. What I actually loved about the book is the touching and sensitively written plot it based upon. This book beholds one of the most significant and heart warming story that can touch any reader's heart since the very beginning of the book. Though it was bit lengthy that it took me more than one sitting to finish. But it was completely worthy my time. I would love to recommend this one. Interesting insight into what it must have been like to emigrate from Greece to America. In two parts it tells the story of Anastacia embarking on single motherhood in a new country with the support of her close friends. The second part is her daughter Sophia's story growing up as a Greek-American teenager.I found the first part grabbed me more than the second but I enjoyed the journey. Full of joy and sorrow, this book embraces all the emotions of life. Recommend to readers who enjoy family sagas and sweet romance. A delightful story of two Greek families relocated to New York. Strong female characters hold the families together through tragedy and joy. I picked up a great sense of both Greek culture and the historic period covered, the 1950s to 1970s. I thought the inclusion of several Greek receipes a lovely touch. A multi-generational family saga that follows the characters through love, tragedy, heartache, and the stages of life. Evanthia’s Gift, the first book in the Gift saga, is a brilliantly written, touching, and emotionally charged story. Kammenou’s characters are engaging and real, providing the reader with not only the ability to connect with each but to engage in their emotional journey. Each was realistically flawed, broken, or somehow affected by their past, which made the reader engage in thei A multi-generational family saga that follows the characters through love, tragedy, heartache, and the stages of life. Evanthia’s Gift, the first book in the Gift saga, is a brilliantly written, touching, and emotionally charged story. Kammenou’s characters are engaging and real, providing the reader with not only the ability to connect with each but to engage in their emotional journey. Each was realistically flawed, broken, or somehow affected by their past, which made the reader engage in their story on a personal level as much of what these characters experience is very relatable. The author’s ensemble cast of characters helps to elevate the story-lines and the Greek culture, which she is portraying. Not only do her characters and story-line provide a better understanding into this culture but the author adds a personal touch by including authentic recipes inside the books pages, a wonderful treat for the reader. The author also touches on the historical past of Greece and her people; insight into the horrors attributed to the Nazi invasion, the religious aspects of the characters homeland, and the personal past that contributes to each character’s development. She also provides the reader with beautifully rendered visuals through her artistic world-building. The plot twists keep the reader engaged but are realistic, enhancing the difficulties of maintaining relationships over years and through generations. Wound into the fabric of this multi-generational story are an exceptional group of antagonists – whether they be estranged sisters, ex-husbands, pride, or life-threatening diseases, Kammenou does not shy away from portraying them in their tragically wicked, agonizing, and heart wrenching dark truth. The story is possibly the most emotionally draining read I have experienced in a very long time. It takes a talented writer be able to evoke a multitude of emotions from a reader in such an intense and breathtaking way. Kammenou has managed to do this in spades. Clearly, the author has a very personal connection with the culture, the places depicted in her book, and the “family saga” that she portrays in the pages, making Evanthia’s Gift a book that is truly inspirational and authentic. I have already purchased the second book in the series and am looking forward to reading it very soon. I was gifted this book by Effie and I was nervous to read it as I don't usually like books from the 1950-1970s timeframe. But this book blew me away. I loved the way the writing flowed and I was sucked in to all the Greek history of the story. There are two love stories in the book and some heartache too. The first story starts with Ana and Alex and then their daughter Sophia. The book spans many years and I wish we had more of Alex. He was my favorite Hero and how despite everything he went thr I was gifted this book by Effie and I was nervous to read it as I don't usually like books from the 1950-1970s timeframe. But this book blew me away. I loved the way the writing flowed and I was sucked in to all the Greek history of the story. There are two love stories in the book and some heartache too. The first story starts with Ana and Alex and then their daughter Sophia. The book spans many years and I wish we had more of Alex. He was my favorite Hero and how despite everything he went through as a boy he turned into an amazing person. I can't wait to read the next book. In the 1950s Anastasia Fotopoulos leaves her husband after finding him in bed with another woman. She soon finds out she is pregnant with his child, and with the support of her friends, Stavros and Soula Papadakis, and other family members, Anastacia decides to raise the child as a single mother. When an old friend, Alexandros Giannakos, comes back into the picture and starts pursuing her, Anastacia tries her best to suppress her attraction to him with little success. But their love story could In the 1950s Anastasia Fotopoulos leaves her husband after finding him in bed with another woman. She soon finds out she is pregnant with his child, and with the support of her friends, Stavros and Soula Papadakis, and other family members, Anastacia decides to raise the child as a single mother. When an old friend, Alexandros Giannakos, comes back into the picture and starts pursuing her, Anastacia tries her best to suppress her attraction to him with little success. But their love story could come to an abrupt end if secrets from the past resurface. Fast forward to the 1970s and teenagers, Dean and Demi Papadakis and Sophia Giannakos, are practically related as their families have been neighbors and close friends for years. Sophie and Dean have always had a close connection but they finally act on those feelings and develop a secret romance. But when Dean breaks Sophie's heart, the two go their separate ways and soon their lives are on very different paths. I'll admit I put off reading this book after I got it because I was dreading reading a 500+ page book. However, given the story spans multiple generations, the book keeps a nice pace and is actually a fairly fast read. The book is very satisfying because you get to witness the course of people's lives and watch them grow and learn. It's also a great inside look into Greek culture as the different generations balance their Greek heritage with living in America. The book does sometimes veer into soap opera territory which can be good and bad. The story lines are interesting enough and you feel invested in the characters but at times it can be fairly predictable and melodramatic. Overall though this was a pleasant read that I would recommend if you like romances and/or family dramas. As a nice touch, the book also includes quite a few recipes for the different Greek food that was mentioned. I won a free copy of this book in a giveaway but was under no obligation to post a review. All views expressed are my honest opinion. I found the story of the 2 Greek families compelling and full of information and emotional depth ! It kept me captivated from beginning to end ....and I'm very glad Effie Kammenou has already written sequels! Looking forward to continue following their Saga ! This novel is a Greek-American saga told over several decades. In today’s terms the families and children are co-dependent, deeply religious and enmeshed and it all—ultimately--works for them. The struggles for true love are cataclysmic, seismic in their effect on the families but unlike modern society with its godlessness, abortion and families-without-fathers and mothers-without-partners there is a promise here that tradition can triumph. That patriarchy ultimately rules. The women work in the This novel is a Greek-American saga told over several decades. In today’s terms the families and children are co-dependent, deeply religious and enmeshed and it all—ultimately--works for them. The struggles for true love are cataclysmic, seismic in their effect on the families but unlike modern society with its godlessness, abortion and families-without-fathers and mothers-without-partners there is a promise here that tradition can triumph. That patriarchy ultimately rules. The women work in the kitchen while the men talk politics and sip ouzo. There are long tentacles reaching out from Greek culture. Accepting the tentacles is not easy for the young but in the end it is everything. The prose is focused but prosaic. Every emotion is parsed over and over. This slows the overall pace and damages any sense of impending moment. But generational struggles are repeated with fluid truths and ultimate triumphs. Greek-American (and perhaps other Middle East cultures) will recognize their lives within these tightly knit (sometimes suffocating) families. But the happy rewards of always regaining the tracks no matter what the smash-up guarantees a good read to those praying for family closeness. It is not often when an author can make me smile and then a few pages later make me hold back my tears. The story flowed smoothly and is set in New York and Greece. Adding some history of events that occurred during war times in Greece. 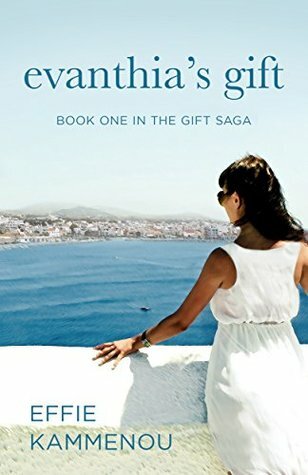 Evanthia’s Gift, begins with Ana as a young woman, with devastating discoveries that she slowly overcomes with the help of her family, friends Stavros and Soula and later with Alex the love of her life. Several surprises await the reader with twists and turns that It is not often when an author can make me smile and then a few pages later make me hold back my tears. The story flowed smoothly and is set in New York and Greece. Adding some history of events that occurred during war times in Greece. Several surprises await the reader with twists and turns that had me talking out loud to myself! I gasped when Irini showed up at the end. The characters of Sophia, Dean and Demi are so strong that it is impossible to loose interest in the book. This is one of those stories that I do not want to see end for when it does, I will miss all the families, especially Dean and when he says, Sophia mou, my heart would skip a beat! Coming from a Greek family and raised in North America I can relate to the two very different cultures and my own struggles with acceptance. Some of the best Greek recipes are printed in between chapters and this is a big bonus for any reader. The near ending was unexpected and I’m glad the author added a happy finale. I certainly recommend this book to readers that enjoy reading about family, friends, love for one another, romance and the roller coaster ride of life. I am anxious to read Book 2 and 3 of The Gift Saga! Evanthia's Gift is a beautifully written story with incredible character that will stay on your mind even if you have already finished reading. This book is the first of The Gift Series, and it is one for the ages. This story is one of the most real and passionate novel's I have read in a really long time. If I could compare this book to any other book it would be Little Women because of the close family and heartbreaking moment that Effie was able to create. The pace and flow of this kept me ea Evanthia's Gift is a beautifully written story with incredible character that will stay on your mind even if you have already finished reading. This book is the first of The Gift Series, and it is one for the ages. This story is one of the most real and passionate novel's I have read in a really long time. If I could compare this book to any other book it would be Little Women because of the close family and heartbreaking moment that Effie was able to create. The pace and flow of this kept me earning for more and it a wonderful feeling (probably not as wonderful as knowing I had the second book ready to start reading as soon as I wrote this review.) to have. I will not lie, I am Leary of books that are more than 500 pages and is the first part/beginning of a series. However, this book doesn't seem to be that long, it is close to 550 pages but its this wonderful literary piece that makes you think and feel in ways you may never have felt or ways you haven't felt in a really really long time. Effie, I want to thank you for the copy of the first two books of this series, I have not started the second one (but trust me when I say that I will after I post this) but I know that if it is half as good as Evanthia's Gift than it will be well worth the read. This is the only book I have ever wanted to rate more than a 5 star. If I could I would rate this a 6 or 7 star. This book is absolute perfection. This first book in The Gift series is really a celebration of love – both romantic and familial. Whilst it is concerned with two romantic love stories; that of Anastacia in the 1950’s and of her daughter, Sofia, in the 1970’s, these romantic love stories are held together by a rich tapestry of Greek family life. It is this depiction of Greek life, far more than the love stories, which interested me. We learn all about the struggle for the Greeks to keep their culture, traditions and religious ob This first book in The Gift series is really a celebration of love – both romantic and familial. Whilst it is concerned with two romantic love stories; that of Anastacia in the 1950’s and of her daughter, Sofia, in the 1970’s, these romantic love stories are held together by a rich tapestry of Greek family life. It is this depiction of Greek life, far more than the love stories, which interested me. We learn all about the struggle for the Greeks to keep their culture, traditions and religious observances alive in a foreign land, and how hard it is for them to do this as generations pass. The children born in America do not know about the atrocities visited upon members of their family by the Nazis and the Ottoman Turks. Parents do not want their children to be burdened by the past but they do want them to remain essentially Greek and marry partners who are part of the same culture. The problems that arise from marrying outside one’s culture are very well portrayed in this book. The love stories are satisfactorily resolved – eventually! I am never a patient reader when it is glaringly obvious that two people belong together but spend years making other people and themselves unhappy before finally doing what they should have done twenty or so years before. I am looking forward to the sequel. "Evanthia's Gift" is book 1 of the Gift Saga, and follows the life of Ana Fotopoulos in the 50s, and continues following the story of Ana and Alex's secrets and their daughter Sophia's life into the 70s. This tale is a rollicking great read, full of Greek traditions and family issues. The Giannokos and Papadakis families are heart-warming to read about and the adventures of the star-crossed lovers Sophia and Dean is a story for the ages. When they both marry other people, I fe "Evanthia's Gift" is book 1 of the Gift Saga, and follows the life of Ana Fotopoulos in the 50s, and continues following the story of Ana and Alex's secrets and their daughter Sophia's life into the 70s. When they both marry other people, I felt like all hope for their relationship was gone. But they fooled me and it all turned out in the end. I just love a happy ending, and this filled the bill exquisitely. All in all, this was a book I truly enjoyed, and I suggested my wife read it too. She also loved the story and said "Ok, I really did not want this book to ever end!" So two happy readers here, and a big recommendation to try this book out because you'll be happy you did. This is the first in what promises to be a sweeping saga of family life. This book spans 50 years in the lives of two closely intertwined families. It begins in 1956, and tells the story of Anastacia Fotopoulos, who is betrayed by her husband and has to bring up her daughter alone. We follow her as she struggles to trust the man who can help her live a fulfilled life. The story then moves to the 1970’s and the story of Anastacia’s daughter, Sofia. Sofia falls in love deeply when she is very youn This is the first in what promises to be a sweeping saga of family life. This book spans 50 years in the lives of two closely intertwined families. It begins in 1956, and tells the story of Anastacia Fotopoulos, who is betrayed by her husband and has to bring up her daughter alone. We follow her as she struggles to trust the man who can help her live a fulfilled life. The story then moves to the 1970’s and the story of Anastacia’s daughter, Sofia. Sofia falls in love deeply when she is very young and is let down by her lover. It takes more than 20 years for her to find happiness again. What sets this book apart from other such stories of love and loss is that it is set in the American Greek community. I have read many books by second generation American Indians, Italians and Chinese but this is the first book I have read set in the Greek community. I learned a huge amount about the Greek culture and religious observances from this novel. The chapters are also interspersed with Greek recipes, which really bring the many feasts celebrated in the book to life. Effie Kammenou is a believer that it is never too late to chase your dreams, follow your heart or change your career. She is proof of that. At one time, long ago, she'd thought that, by her age, she would have had an Oscar in her hand after a successful career as an actor. Instead, she worked in the optical field for 40 years and is the proud mother of two accomplished young women. Her debut novel, Evanthia’s Gift, is a women’s fiction multigenerational love story and family saga, influenced by her Greek heritage, and the many real life accounts that have been passed down. She continues to pick her father’s brain for stories of his family’s life in Lesvos, Greece, and their journey to America. Her interview with him was published in a nationally circulated magazine. Evanthia’s Gift: Book One in The Gift Saga was a 2016 award finalist in the Readers Favorite Awards in the Women’s Fiction category. Waiting for Aegina: Book Two in The Gift Saga is Kammenou’s latest release. Effie Kammenou is a first generation Greek-American who lives on Long Island with her husband and two daughters. When she’s not writing, or posting recipes on her food blog, cheffieskitchen.wordpress.com, you can find her cooking for her family and friends. As an avid cook and baker, a skill she learned from watching her Athenian mother, she incorporated traditional Greek family recipes throughout the books. She holds a Bachelor’s Degree in Theater Arts from Hofstra University.